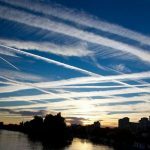 A public demand to ban stratospheric aerosol geoengineering, weather modification, cloud seeding and the deliberate aerial spraying of chemical aerosols. With geoengineering being defined as “the deliberate large scale intervention in the earth’s climate system in order to moderate global warming”, a brief presentation of the arguments of climate change is presented here. Whilst all eminent scientists agree that climate change is indeed occurring, there is a significant divide between them. Whilst some advocate the idea of carbon-related (man-made) anthropogenic global warming (AGW), others insist that climate change is a natural phenomenon that has been occurring for thousands of years and that the planet is actually cooling rather than warming. This section presents a brief overview of the claims made by both sides of the debate. Global temperatures have been increased over the last 150 years, in accordance with industrialisation and the increased burning of fossil fuels. Arctic and Antarctic ice is reducing. No global warming has been recorded for 17 years, but that is because more of the heat has gone into the oceans. There has been an ongoing sea level rise of approx. 7” per century since the last ice age. There is no evidence supporting the oceans-absorbing-heat theory. The term geoengineering is used to describe the intervening steps that could be taken by man to combat (man-made) anthropogenic global warming (AGW). As previously presented in this document, there is huge doubt surrounding the idea of AGW which, in itself, leads to concerns that geoengineering measures may be unnecessary and, therefore, be a possible waste of time, money and resources. Of utmost concern, however, are the risks that are associated with geoengineering. And whilst many geoengineering practices are already patented and underway, attention must be paid to one particular aspect of geoengineering, Stratospheric Aerosol Geoengineering (SAG) which includes a technique known as Stratospheric Aerosol Injection (SAI). Whether such SAG operations will actually reduce global temperatures (should this even be necessary) is in dispute, as presented later in this document. Increase of ‘global dimming’  – Over 20% of the sun’s direct rays are no longer reaching the planet – believed to be caused by an increase in air pollution. Whilst some of these issues may represent an obvious opportunity for certain stakeholders to profiteer, each issue is a risk that poses a real, serious problem for the rest of us. Further, when considering the views of the many imminent scientists and organisations that disagree with the underlying concept of man-made climate change, casting doubt on the very notion of Anthropogenic Global Warming, it can be concluded that these may all be unnecessary risks. In addition to Stratospheric Aerosol Engineering, it is pertinent to examine other aerial spraying programmes that have been associated (officially or otherwise) with the UK and are not held in a moratorium. Whilst the term ‘chemtrails’ (a contraction of ‘chemical trails’) may be dismissed by some as a silly word to describe a silly idea, it should be noted that the term was used in the USA’s own Space Preservation Act of 2001 when proposing which exotic weapons systems should be banned – but was omitted from the final draft, so was therefore not banned and is still permitted. The term was first introduced by the Department of Defense as the title for a US Air Force’s Chemistry course training manual, and is now so common that it features in the Oxford dictionary (despite citing an incorrect origin). As illustrated in the previous Stratospheric Aerosol Geoengineering (SAG) section, jet aircraft trails are being implicated as, somehow, both the cause of and the solution to climate change and weather extremes. 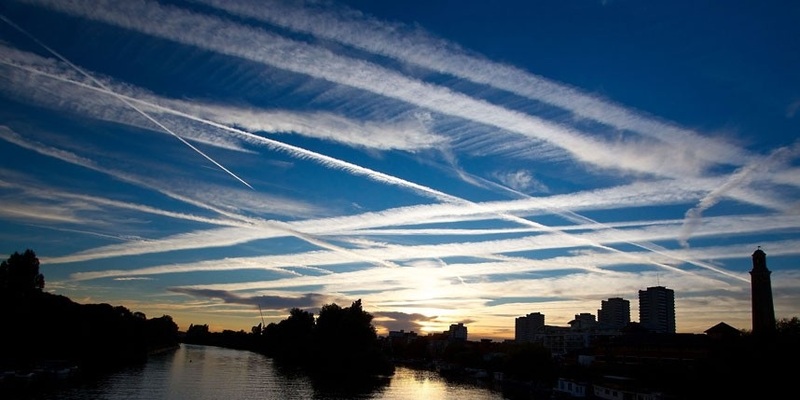 With the IPCC’s own Climate Scientist, Dr Joyce Penner, stating “The contrails that are spreading that you can identify as contrails, those would tend to warm the atmosphere”,  the idea that SAG would reduce the issue of Anthropogenic Global Warming (AGW) is highly debatable. An IPCC Special Report also confirms “Contrails tend to warm the Earth’s surface, similar to thin high clouds”  – again, suggesting that SAG would be a cause of climate change rather than a solution. Given the highly contentious nature of the AGW issue, the concerns about the IPCC and the evidence presented in the following section, the true intention of any aerial spraying activity (along with its consequences) should be carefully considered. This section presents an abundance of evidence that Aerial Aerosol Spraying activities are already underway, and concludes with what action must be taken. The vast majority of persistent trails in the sky do not come from commercial flights as the planes involved usually don’t appear on www.flightradar24.com (whereas over 80% of commercial UK flights do). Anecdotal evidence of two planes flying at similar altitudes, locations and times, where one plane leaves no trail, but the other leaves a trail that persists for hours. This photo shows the ‘persistent contrail’ phenomenon hitting London on 14th September 2012. Such skies cannot be recalled before 1997 but are occurring with increased frequency in recent years. 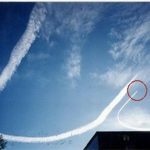 An extreme example of persistent trails that clearly does not match the official explanation of them coming from commercial planes. On-off spraying captured on video by a pilot. 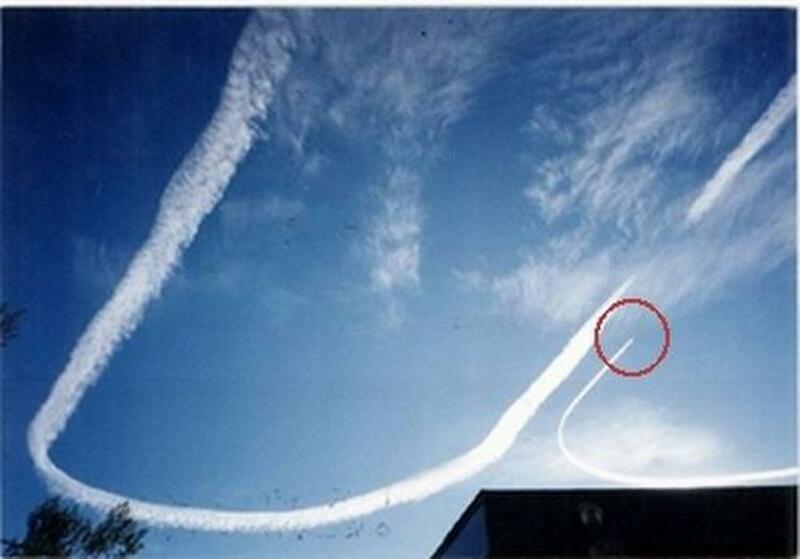 Low altitude on-off spraying from military planes captured by a pedestrian. That deliberate Aerial Aerosol Spraying activities are being performed now is not just the most likely explanation, but it is the only explanation that fits with all the available evidence. The Geoengineering Moratorium under the UN Convention on Biological Diversity3 was agreed by the 193 signatories to the convention in order to outlaw geoengineering projects “until there is an adequate scientific basis on which to justify such activities and appropriate consideration of the associated risks for the environment and biodiversity and associated social, economic and cultural impacts”. Unfortunately for the public, the agreement exempted “small-scale scientific research studies”, weather modification and carbon capture. The main purpose of this Directive, therefore, is to advance the moratorium with a permanent ban on geoengineering, weather modification, cloud seeding and the deliberate aerial spraying of chemical aerosols. We must do something about this, because without our intervention, vast amounts of toxic substances will continue to be sprayed into the atmosphere. Such activities, as well as being possibly unnecessary, are untested and already verging on the catastrophic for man, animals and our environment. To fully inform the Wider General public of the United Kingdom about all atmospheric aerosol injection and spraying programmes – whether they are weather modification, geoengineering activities, experimental, testing or otherwise – and to explain why such activities are being allowed to take place in UK airspace without our fully informed permission or consent. Granting of independent and government investigations of aerial spraying, including aircraft inspection and regulation of aircraft, aircraft fuel and aircraft emissions. To advance the UN moratorium with the banning and cessation of climate geoengineering, weather modification, cloud seeding and the deliberate aerial spraying of chemical aerosols that occur in UK airspace without the permission and consent of the majority of the wider general public. To ensure any solar radiation management technique may only be reconsidered after a public debate on anthropogenic global warming and all forms of geoengineering (including solar radiation management and stratospheric aerosol geoengineering) has been conducted and concluded, with leading, independent figures from each side of the argument involved throughout. The Unified Atmospheric Preservation Act (UAPA). To bring the Unified Atmospheric Preservation Act (UAPA) into law. 01-Dec-2013 – Main changes: total rewrite; IPCC and NIPCC introduction. 21-Dec-2013 – Main changes: inclusion of ban to include all aerial aerosol spraying (i.e., not just stratospheric aerosol geoengineering). Google videos search for “chemtrails”: 19,500,000 results (October 2013) – https://www.google.co.uk/#q=chemtrails&tbm=vid. Google web search for “chemtrails”: 4,880,000 results (October 2013) – https://www.google.co.uk/#q=chemtrails.